Hot Tub Heaven #3, like our other eight properties, is located on Blue Mountain in Linden, Virginia and is open year round. Surrounded by the Blue Ridge Mountains in the beautiful Shenandoah Valley it offers two Queen-size beds and one full bathroom... A fully equipped modern kitchen, a big screen tv, turntable with classic vinyl records and on the deck are a grill for cookouts & a wonderful 6-person hot tub... Plus, dogs are welcome! Hot Tub Heaven #3 is located only minutes from Shenandoah National Park, Sky Meadows State Park, and the start of Skyline Drive... This cabin is in the heart of Virginia Wine Country! Explore dozens of wineries all within 30 minutes of the cabin! Click here for a map of the local wineries. You will also enjoy access to our community's Deer Lake (click here for a picture) - enjoy fishing and swimming right down the road from the cabin. Each season of the year has its own charm and attractions.... Canoeing, hiking, horseback riding, kayaking, antiquing, golfing and fishing are all activities local to our area! Plus, the Appalachian Trail is just up the road - at the top of our mountain - it's about a three minute drive from HTH #3 to the entrance of the AT! We look forward to accommodating you on a very special mountain getaway. Now at Hot Tub Heaven we offer... Onsite Massage Therapy! Massage services offered... Therapist will travel to you - to your cabin! This is a real treat and would make a great surprise for a loved one! Click Here for detailed information including, how to contact Cheryl and previous guests' massage testimonials. We love this area and opened Hot Tub Heaven on Blue Mountain because the Shenandoah National Park is the number one reason people from around the world visit our area. Guests will also enjoy visiting Skyline Drive, Shenandoah River State Park, State Arboretum of Virginia and right at the top of our mountain - a short distance from any cabin - is the Appalachian Trail! Trail hiking is popular year round, as is bird and wildlife watching! Hot Tub Heaven is in the heart of Virginia Wine country! Explore dozens of wineries within 30 minutes of the Chalet! Including our mountain winery, Fox Meadow. Wineries like Fox Meadow, Rappahannock Cellars, Naked Mountain and several others are open 7-days a week. On weekends, the possibilities are limitless. Skyline Caverns and Luray Caverns are also must sees and short drive from Hot Tub Heaven. Guests should also consider day trips to places like New Market and America's Celebration on Parade, Shenandoah Caverns (the only cavern in the valley with an elevator), the Natural Bridge, Monticello, Walton's Mountain, Montpellier, Manassas Battlefield and even Washington, DC. Since the Shenandoah Valley is where a large share of the Civil War Battles occurred, there are several driving tours, such as the Battles of Front Royal, Cedar Creek, Fishers Hill, New Market, and Winchester, Kernstown, Rappahannock County and Harper's Ferry. The Walking tours of Front Royal, Winchester, Luray are excellent ways to experience the various rich histories amid a relaxed do it at your own pace atmosphere. Driving scenic roads (such as Fort Valley Road) and exploring small towns like Syria, Little Washington, Sperryville, Shenandoah, Rileyville, and a million other such towns and hamlets in the Valley. Visits to Belle Grove Plantation, (540) 869-2028 or Long Branch Estate (888) 558-5567 or the Virginia Arboretum (540) 837-1758 are always recommended. Antiquing and shopping are always fun and in abundance in our area. • 6 Person Hot Tub • 43' Big Screen TV • Large Deck • Fenced-in backyard • Massage Therapy • Gas Log Fireplace • Washer & Dryer • Air Conditioner • Microwave • Coffee Maker • Toaster • Dishes • Utensils • Cookware • Glassware • Refrigerator • Oven Range • Telephone • Linens & Pillows • Bath & Kitchen Towels provided • Toilet Paper • Paper Towel • Smoke Free Indoor Environment • Driving directions to local grocery stores, shopping centers and restaurants. This cabin is way up the mountain - very quiet, secluded and private. The interior is basic, has all you need for a weekend stay. The hot tub is lovely for an evening soak after a hike. We didn't use the kitchen much--there are nice places to eat out in Front Royal and other towns nearby. It''s a good 30 minutes into town so plan accordingly. Lots of wineries nearby and the Shenandoah River Park is great. Good location for enjoying the outdoors and what the valley has to offer. Cabin #3 felt super comfy from the moment we walked in the door. Definitely felt like a home away from home. All the special touches made it so fun - the gorgeous fireplace, the zen den and the hot tub, the TV and wifi. It was so close to everything, the lake, Front Royal, Skyline Drive, and the wineries. The owners are a delight and so accommodating. Everything about this place is warm and welcoming. Our experience at the Cabin #3 was just amazing. It surpassed our expectations. We had everything we needed and then some. Looking forward to our next getaway. Cabin #3 feels just like home. Finding the house/cabin in total dark after 1 hour of wandering the heavy wooded gravel roads, we finally turned on the GPS and amazingly we were there! GPS worked after getting of I-66. Strongly recommend GPS's use within neighborhood 'cause there are multiple inside routes. the view of the woods from the loft and deck, finding oldie 33 vinyl records which we danced to, hot tub, large deck for morning coffee, washer and dryer usage (thank you! ), and fenced yard for dog. We had such a great time during our stay at Cabin #3. Tom and Deneane always had a quick answer to any questions we had and were extremely accommodating with anything we needed. We had such an amazing time we extended our stay an extra night! 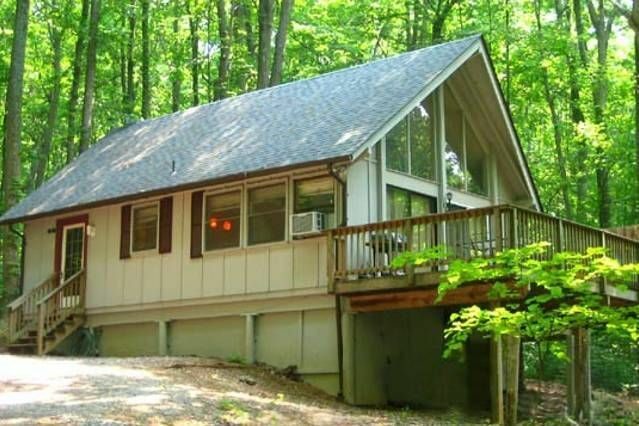 This cabin is also located a mere 15 minutes or so from the Shenandoah National Park and Skyline Drive. We will definitely be back again next year!! We stayed in a cabin for two nights in May this year. Such a beautiful location with views of spectacular sunsets. Our cabin was fully equipped and extremely comfortable. Our toddler had so much fun running around and exploring the grounds and loved the swing and chickens. We will definitely be staying here again! Canoe, kayak, raft or tube the Shenandoah River. Amusement parks, Spalshdown Water Park, go exploring at Luray Caverns, Skyline Drive and Sky Meadows State Park. Visit historic places. Visit Washington, DC, national museums, only an hour away. Golfing. Horseback riding. Visit local Virginia Vineyards. Golf: Shenandoah Valley Golf Club, located at 134 Golf Club Circle, Front Royal, features three nine-hole courses. Public course. The facility also features a pro shop, banquet facilities and a snack bar. Call 540.636.4653 for more information. Jackson's Chase at Pine Hills Golf Club, is an 18-hole public course laid out over several knolls once roamed by the Confederate Army under General Thomas A. 'Stonewall' Jackson. It is located at 65 Jackson's Chase Drive in Middletown. The facility features a pro shop, putting green, driving range and snack bar.